Bollywood is witnessing a turnaround this year as much hyped movies underperforming at the box office and mid-budget flicks like Sonu Ke Titu Ki Sweety, Stree, Hichki, Parmanu, Andhadhun to name few, doing wonders at ticket windows. 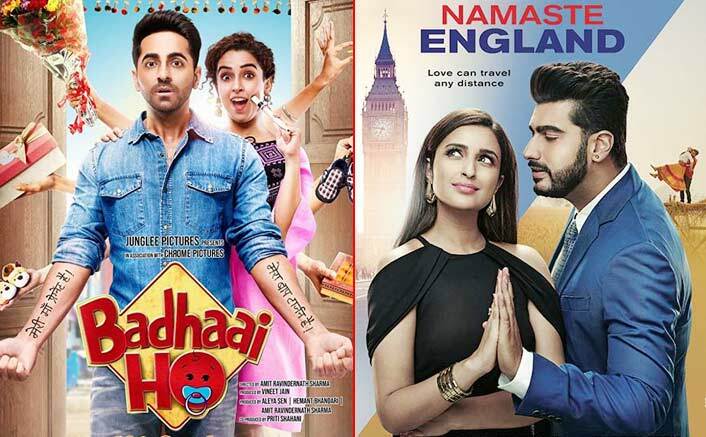 Same scenario happened last week, when Arjun Kapoor-Parineeti Chopra starrer Namaste England, boasting of pre-release buzz and chartbuster songs, clashed with Ayushmann Khurrana – Sanya Malhotra starrer Badhaai Ho on Thursday. While Namaste England tanked, the later exceeded expectations by raking huge moolah. Upon its trailer release, Badhaai Ho seemed word-of-mouth dependent affair. Though it starred Ayushmann in lead, who received applause for the portrayal of blind pianist in a recent hit Andhadhun, it was never expected from an actor to solely shoulder the movie. It clashed with much-hyped Namaste England, backed by credible names like Arjun-Parineeti and director Vipul Shah. From opening day itself, positive word-of-mouth and rave reviews started showing its impact as Badhaai Ho opened with an impressive figure of 7.35 crores. Namaste England on the other hand, suffered due to negative feedback from audiences as well as critics and went on to collect a dismal 1.90 crores. On second day, Badhaai Ho witnessed a jump and collected 11.85 crores, while Namaste England accumulated just 2 crores. Continuing the trend, Ayushmann starrer further jumped on day 3 by collecting 12.80 crores, while Namaste England dropped and raked 1.49 crores. On first Sunday i.e. day 4, Badhaai Ho showed expected growth by raking 13.70 crores thus thrashing Namaste England which collected 1.06 crores. Continuing the winning streak, Badhaai Ho passed the litmus test of weekdays by remaining rock steady as it collected 5.65 crores, 5.50 crores and 5 crores on day 5, day 6 and day 7 respectively. On the other hand, Namaste England sealed its fate at box office by garnering negligible amount of 60 lakhs, 40 lakhs and 40 lakhs* during weekdays. Zero: Will It Retain Shah Rukh Khan’s Majesty At The Box Office? With a stupendous run at the box office, Ayushmann’s comic caper made a grand total of 61.85* crores in its first week. While Namaste England fared badly at ticket windows by posting just 7.85* crores in one week. The post Badhaai Ho VS Namaste England At The Box Office: Day Wise Breakdown Of How Content Won! appeared first on Koimoi.